this Zion Williamson kid is just incredible man. I don't know how skilled he's gonna wind up being but people that big aren't supposed to be able to move like him. every single time it's GOOD GOD, then he keeps doing it. The Los Angeles Lakers plan on pursuing another max contract free agent next offseason. The 2019 free agency class includes Kawhi Leonard, Kevin Durant, Jimmy Butler, Kyrie Irving, Klay Thompson, DeMarcus Cousins and others. According to a source close to Butler, he's open to the idea of joining LeBron James with the Lakers. The Minnesota Timberwolves traded for Butler on draft night in 2017. 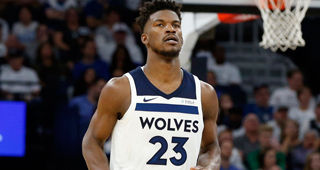 JMHO, I'd make a run at Butler before the trade deadline and offer up Myles or whatever he can fetch in the Trade Market as part of a 3 way trade ( assuming that he'd consider signing an extension ). He has a Player option which I doubt he will take given his bad relationship with the TWolves. Trading a 22 year old potential laden big for a 29 year old wing is an all-in type of move. I do not see TPTB pulling the trigger on a move like that. I'm kinda concerned about Butler's locker room presence as well. I really don't know if he's a good guy for players to be around. Michelle Beadle is already leaving “Get Up!”. What an absolute failure it was to split up “Mike and Mike” and start that garbage show, which by any objective measure is one of the worst shows in TV history. Nor should they do that. So lets trade a 22 year old, smooth-shooting, rim protecting, mobile big - for a 30 year old shooting guard who still isn't an elite shooter and who comes with an expiring contract that he might not re-up, and also a torn meniscus? Why do this when we already have his clone in Alize? Here are some quotes from a trainer that was at Oladipo's mini-camp in Florida. I saw a note somewhere earlier today that said Bojan was the only one absent. Something to do with national team commitments. Please, please, please, please, please let this turn out to be even marginally true! Love this team, which feels especially amazing because the 2016-17 Pacers were among my least favorite teams in my 40+ years as a fan. I don't go back quite that far but I do agree with the idea that the last PG led team was a bust for me. I had more or less quit watching until they picked up Lance for those last 6 games. They were just not fun to watch. This team, on the other hand? Pure joy. Even when they lose games they were much more enjoyable to watch than a win from the previous team. Night and day. Totally agreed.